Spray shallow baking dish with nonstick coating. Place fillets in dish, tucking under any thin edges. Melt butter. Brush on top of fish. Top with bread crumbs. Bake fish in 400 degree oven for 10 to 15 minutes or until fish flakes easily with a fork. While fish is baking, prepare sauce. In small saucepan, stir together milk and flour. Add MacYourself Cheddar Cheese Powder and mustard. Heat to 180° and hold temp for 5 minutes or until thickened and bubbly. To serve, divide sauce among four individual serving plates. 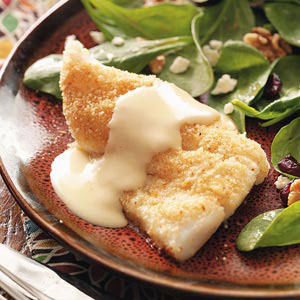 Place one portion of fish on each plate on top of cheese sauce. Garnish with dill weed, if desired.